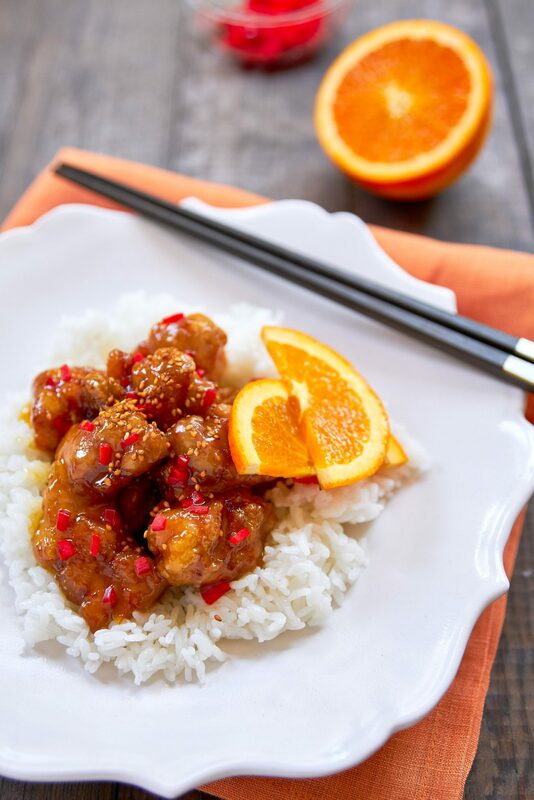 Orange Chicken is a classic Chinese-American take-out dish with pieces of fried chicken coated with a sweet and sour orange sauce. My version is loaded with juicy chunks of gingery marinated chicken, and the all-natural glaze is made with a trifecta of orange to give it a potent citrusy punch. 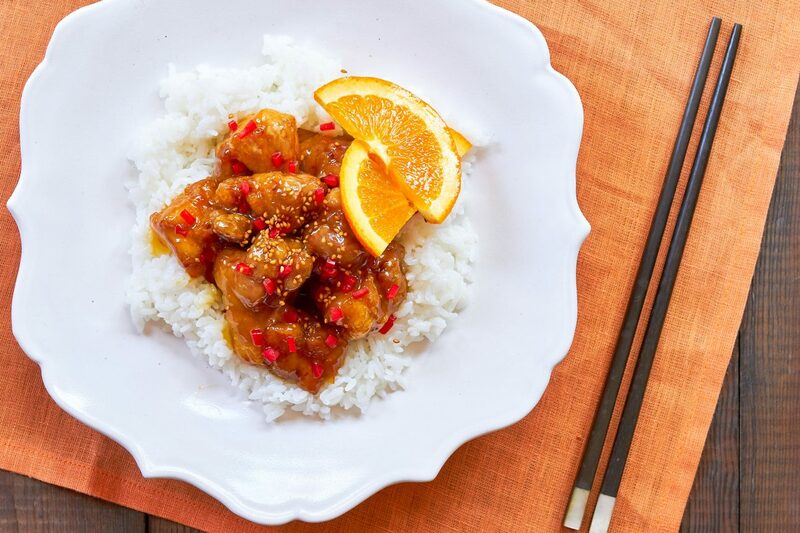 Like most Chinese-American dishes, Orange Chicken does have roots in China, but the version most of us are familiar with in North America is something entirely different from the original. Different isn’t inherently bad, but unfortunately, many take-out shops go overboard on the batter and use artificial colors and ingredients. The thing is, Orange Chicken is so easy to make from scratch, once you make it at home, you’ll never go back to the red pagoda clad paper boxes again. For my take on Orange Chicken, I like to marinate the chicken in a combination of soy sauce, sake, and ginger. 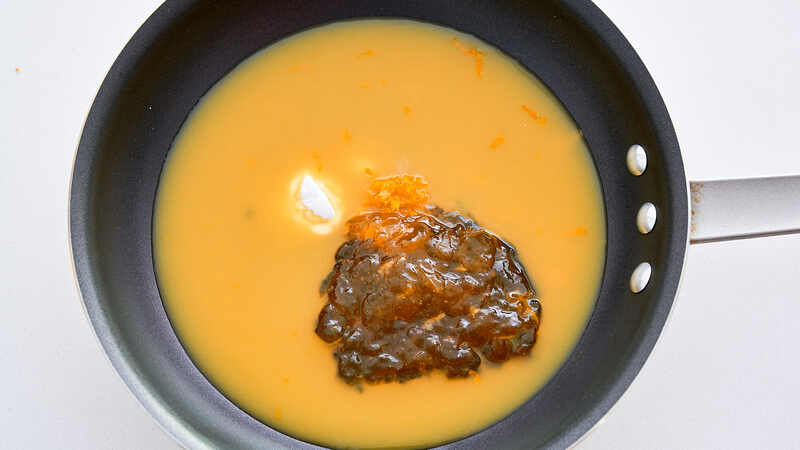 This not only seasons the chicken, imparting loads of umami, It gives it a pleasant ginger kick that complements the orange flavor in the sauce. 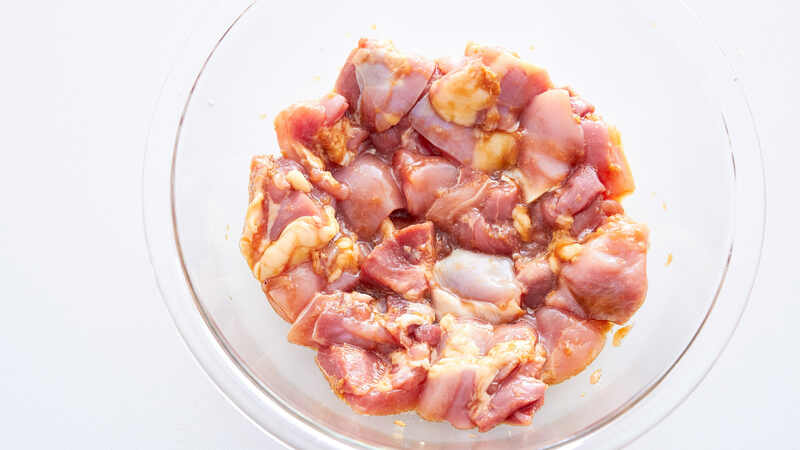 I usually throw the chicken in the marinade in the morning so it’s well seasoned by the time I’m ready to make it for dinner, but you could get away with as little as 15 minutes of marination time. Next, I dust my marinated chicken in a thin coating of potato starch before frying it. 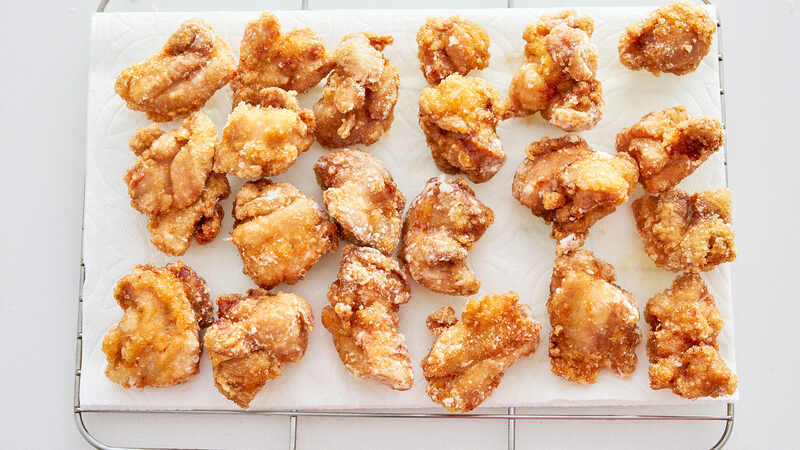 This is essentially how I make my Karaage, so the fried chicken is pretty awesome on its own, and you may be tempted to snack on a few bites before throwing it in the sauce… I prefer this method to using a batter because it’s easier, and it creates a thin crust without becoming greasy and cloying. I know someone is going to ask, so I’ll address it now. You could substitute cornstarch, but it will not be the same, both from a thickening perspective and a texture perspective. Bob’s Red Mill produces a potato starch that’s sold in most upscale grocery stores. For the sauce itself, I wanted there to be no mistake that it’s Orange Chicken you’re eating, so I hit it with a triple dose of oranges. First, there’s marmalade, which is nice because it not only has an intense orange flavor, it’s sweet enough to balance out the tanginess of the second form of orange: orange juice. Finally, there’s some fresh orange zest, which adds a nice pop of zingy orange flavor without using any artificial flavorings. For the marmalade, I like to use a cheap one because they tend to be sweeter and less bitter than the fancy ones. If you insist on getting fancy ingredients, put the money towards buying great chicken instead. As for the orange juice, you need to use a fresh orange anyway for the zest and you should easily get 1/3 cup of juice from one orange. 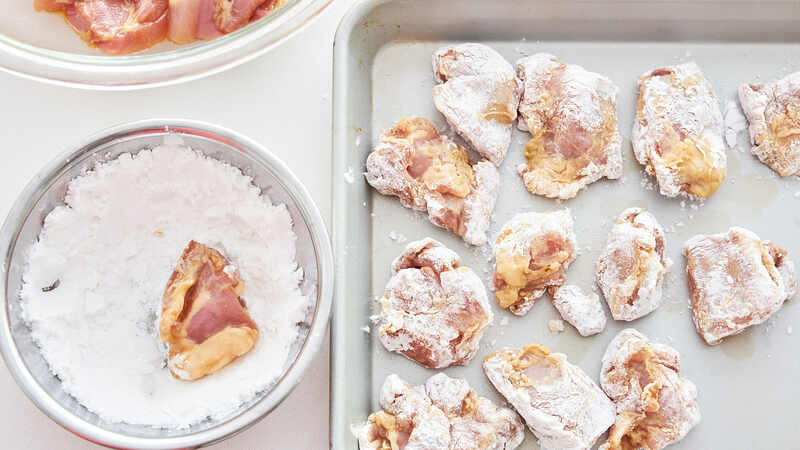 To finish the dish, the fried chicken just gets tossed with the orange sauce until it forms a glossy orange glaze around each morsel of juicy chicken. If you’re going to do a Chinese take-out night at home, try out some of my other Chinese-American classics, like Mongolian Beef, Chop Suey and Chicken Chow Mein. Add the chicken, soy sauce, sake and fresh ginger to a bowl and mix together. Let the chicken marinate for at least 15 minutes, or preferably up to 8 hours. When you're ready to make the orange chicken, preheat a heavy pot filled with 2-inches of vegetable oil to 355 degrees F (180 C). Prepare a paper towel lined rack. 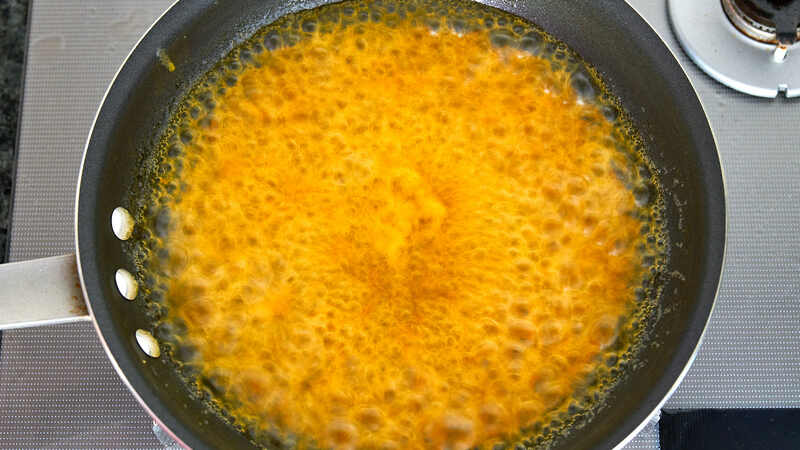 Add all the ingredients for the orange sauce into a pan and whisk together. Add 1/2 cup potato starch to another bowl, and dust the chicken with the potato starch. You want an even coating, but it should not be caked on. 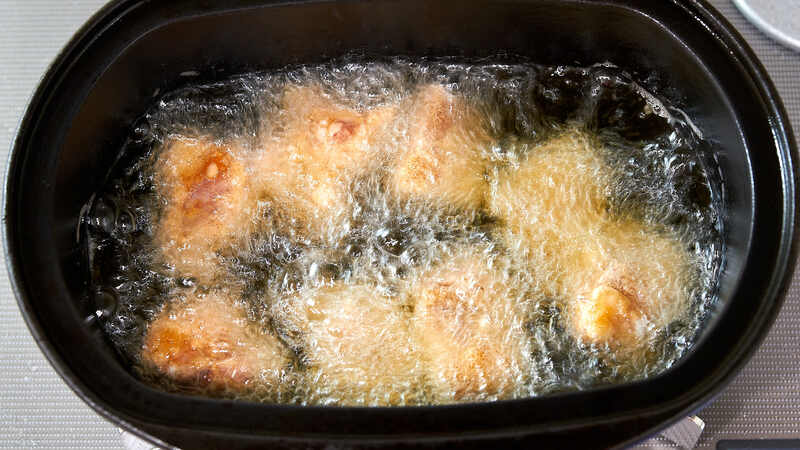 Fry the chicken in batches until golden brown and cooked through, flipping a few times to ensure it browns evenly. Drain the chicken on the prepared rack. When all the chicken is done, heat the pan with the orange sauce, stirring constantly until it thickens. Add the fried chicken to the orange sauce and toss to coat evenly. 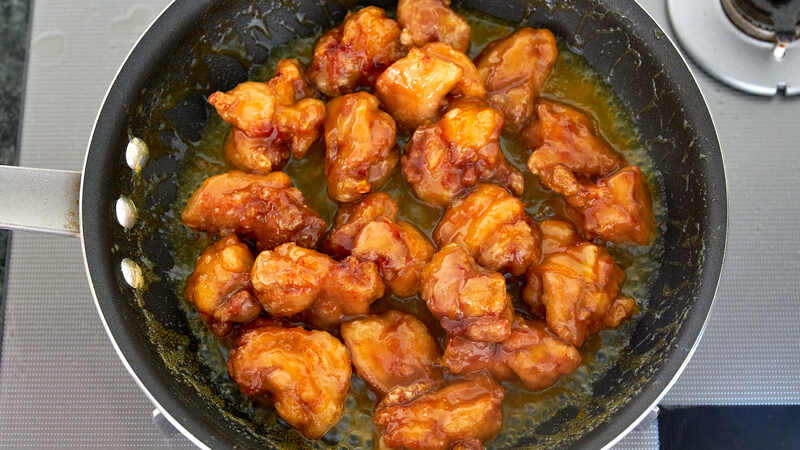 The orange chicken is done when the sauce forms a thick glaze around the pieces of the chicken.